This next weekend you will find us at Fira del Vi de Rubí. The annual gathering of all the wines that have been recognized with a Vinari Award. 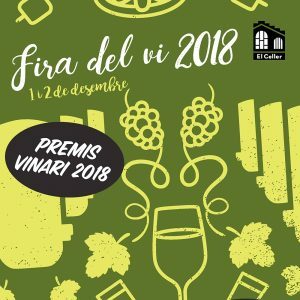 Two full dates filled with loads of concerts, children’s entertainment and, of course, your chance of tasting the best wines from all over Catalonia. We will be introducing our Bouquet d’Alella Blanc, Vinari Bronze Award 2018 in the Young White Wine category. Come meet us on December 1st and 2nd at Celler Cooperatiu de Rubí. Don’t forget to check the whole schedule on this link.